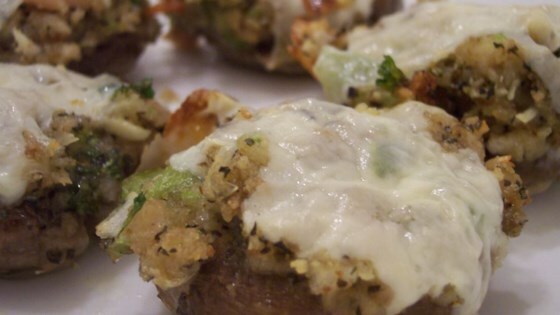 "Delicious mushroom caps filled with a clam stuffing! Very easy, and even better than the stuffed mushrooms from that famous Italian restaurant chain.... Garnish with lemon wedges when serving." Arrange mushroom caps hollow side up in the baking dish. In a medium bowl, mix together minced clams, garlic, Parmesan cheese, onion, bread crumbs, green bell pepper, parsley, Italian-style seasoning and black pepper. Slowly stir in approximately 1/2 the butter, enough to make the mixture slightly moist. Generously fill the mushroom caps with the clam mixture. Sprinkle with mozzarella cheese. Drizzle with remaining butter. This recipe was great! I used a combination of portabellas and baby bellas. Also, I used 1 can clam meat and 1 can crab meat...delicious!